Many Luxury Resort Tent Manufacturers have secured a permanent place at the top of lavish safari and resort tents industry. Flexibility and further attainment endow with an unconstrained span for these well-organized manufacturers to cross the limitations of the ordonnance and manufacture safari lifestyle resort tents. Having an experience of safari life in a luxury safari resort tents is still a dream for many people. Communicating with the wildlife securely and safely is the best feeling ever you ever have. However, many people would think, “Is it possible?” and “If it is possible then How?” In this blog, you will find out all the answers to your inquiries. Yes, experiencing the wildlife in a safari resort tent or in a forest resort tent is possible for common people only because of the safari resort tent manufacturers. Some of the safari resort tents manufacturers are providing the tents that are suitable for the theme of the forest, safari or say wilder life. The majority of the safari resort owners buy their tents from these Tents Manufacturers for enhancing the look of the safari and forest resorts. There are manufacturers in India, which provide A-1 tents going well with the theme of the resorts near a forest or wildlife. Safari Swiss Cottage: Safari Swiss Cottage is the tent that can look like a normal tent but it is more than that because of its carpet span of 288 square feet (24*12 feet) with attached washroom of area 12*6 feet and a veramda of the span of 12*6 also. Inside the tent you get, a proper set of a bed, sofa, a modern wooden table, duo of stylish chairs and a set of garden chairs in the veramda of the tent for enjoying wildlife with soothing. Green Forest: Green Forest is another wonderful resort tent for contacting with the wildlife. This tent has the compact carpet size (12*12 feet) compared to the Safari Swiss Cottage so it can be placed in any small garden or lawn of the resort. African Safari Resort Tent: When we are talking about the safari tents then how an African Safari Resort Tent can stay behind. African Safari Resort Tent gives the feel of having a Safari in African Deserts like Savannah. The Theme and design of this tent are much appropriate for placing in a resort near a desert. With carpet span of 24*16 feet, it is the best tent for safari and desert tour. Safari Villa: Now it is the time to talk about the boss of all the safari and forest tents, The Safari Villa. As you can assume the comfort from its name, it is the finest and most lavish tent for experiencing the wilder life. The front transparent PVC fiber panels allow the guests to admire the looks and wildlife of a forest or a desert from the inside soothe of this Villa. It is a two round shaped compartment tent in which one is a washroom and another is a living room. 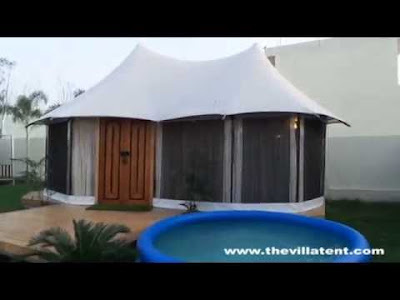 There are lots of Luxury Resort Tent Suppliers in India but it’s up to you choosing the best one for enhancing the splendor of your wild themed resort.